November 28, 2010, 8 p.m. This evening the exhibition will open at 7 p.m.
On November 28th, the New York artist and musician Cory Arcangel will give his first live performance in Berlin as part of the »Works of Music by Visual Artists« series, which has been produced since 1999 by Freunde Guter Musik Berlin e.V. in collaboration with the Nationalgalerie and other partners. 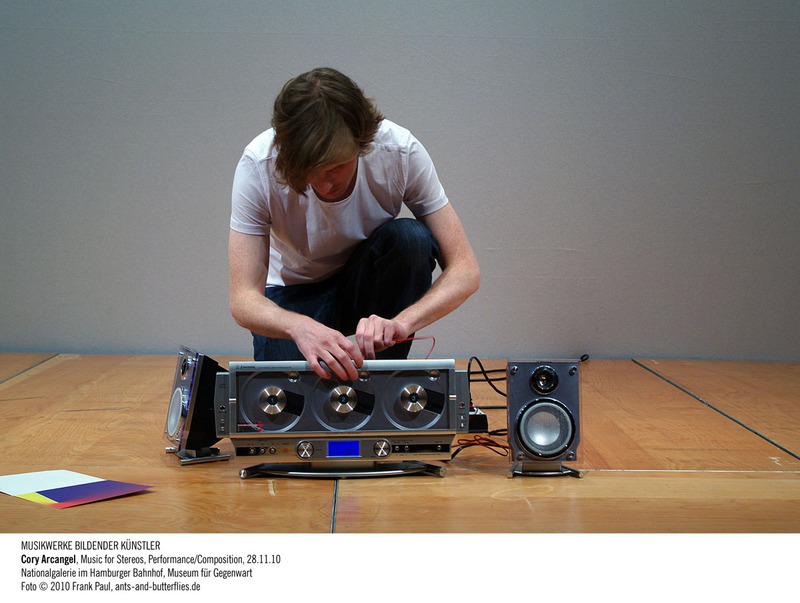 That evening, the artist will present his composition »Music for Stereos«, compiled from a group of pop songs with Lil Wayne’s Knockout as the starting point; the action on stage involves elaborately designed low-end stereo systems. The performance is the prelude to Arcangel’s exhibition »Here Comes Everybody« at Hamburger Bahnhof. The heart of the show is the video installation »a couple thousand short films about Glenn Gould« from 2007. In this double projection, Cory Arcangel interprets a classical score using found material: The piece consists of various video clips that Arcangel took from the Internet, processed with self-designed software, and assembled into an astounding video version of »Variation No. 1« from the Goldberg Variations by Johann Sebastian Bach. Images – 1106 to be exact – of various persons playing one note of the piece on different instruments flash by at breathtaking speed. Cutting and pasting excerpts from different takes – a possibility that pianist Glenn Gould had already used in his recordings – is here humorously taken to an absurd extreme. In his works, Cory Arcangel (born 1978 in Buffalo, NY) deals with the practices and myths of Internet culture, pop music and experimental music. He uses and modifies existing computer programs and develops his own programs for processing visual and sound material. He is interested in the latest trends in the entertainment industry and the everyday use of the Internet, and also in pondering how technologies and codes rapidly become obsolete. His works, which include video installations, sculptural works, Internet projects and music performances, have been shown at numerous international art institutions since 2002. Having graduated from the Oberlin Conservatory of Music in Ohio in 2000, Arcangel first came to the art world’s attention in 2002 with his video piece »Super Mario Clouds«, made by removing the program chip from the classic 1980s computer game and replacing it with his own custom-built chip to endlessly scroll only the clouds from the game. Since 2006 Cory Arcangel has also been using techniques of musical composition dating from the 1960s to work chiefly with found images and sound: »Untitled (After Lucier)« (2006) features the digital video loop of a legendary televised Beatles performance. With a tip of the hat to the famous work »I am sitting in a room…« by Alvin Lucier, Arcangel’s program gradually compresses the image into total abstraction. And in the video work »Sweet 16« from the same year, the source material – in this case two brief segments from the Guns N’ Roses video »Sweet Child O’ Mine« – also is altered via technical intervention with the composition. In this double projection, Arcangel makes use of Steve Reich’s phasing technique, so that the two looped video sequences play in and out of sync with each other. In his exhibition at Hamburger Bahnhof, Cory Arcangel applies the principle of phasing to kinetic sculptures, making a simple shelving system dance. Two other video works also are on view in the show: one using material from You Tube films edited into an Arnold Schönberg music video, and another exposing a Jimi Hendrix video clip to commercial computer software with Auto-Tune function.